You are here: Home / Product Reviews / Babies & Kids / PLAYMOBIL Take-Along Sets: Fairy Unicorn Garden & My Take-Along Farm + Giveaway! One thing that I have always encouraged my girls to do is to have an imagination. No matter what they do or where they are, to remember that they can do anything with a little bit of it. PLAYMOBIL has the perfect toys for kids who love to bring play and imagination with them wherever they go. 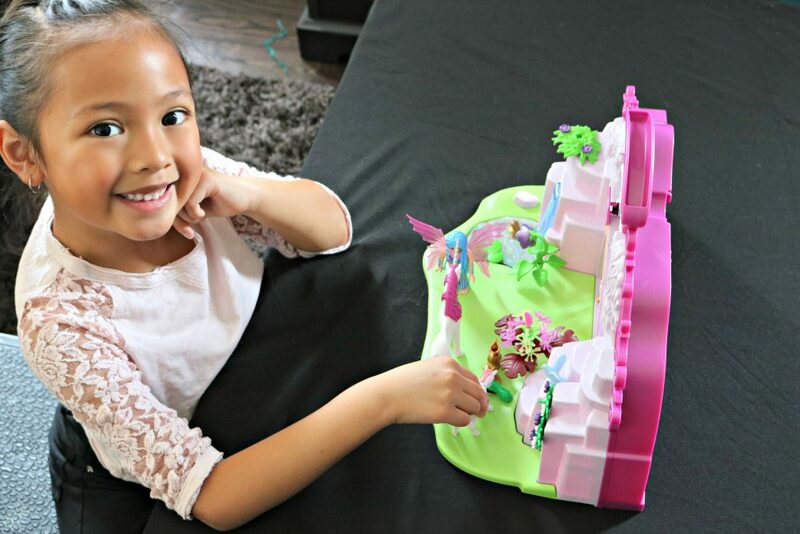 Read on to discover the My Take Along Farm and Take Along Fairy Unicorn Garden play sets! While Mimi is a bit on the older end for these toys, she still enjoys them because she can take them with her wherever she goes. She is the type of child that has always been able to use her imagination with play and would use anything she was around to create a world of her own. Now with these sets and characters, she could do that with actual figurines. She especially took to the Take Along Fairy Unicorn Garden. The fairies and unicorns were her favourite things of course. Though she did love that the set comes with fun scenery. It has everything they need to create a magical world of their own. 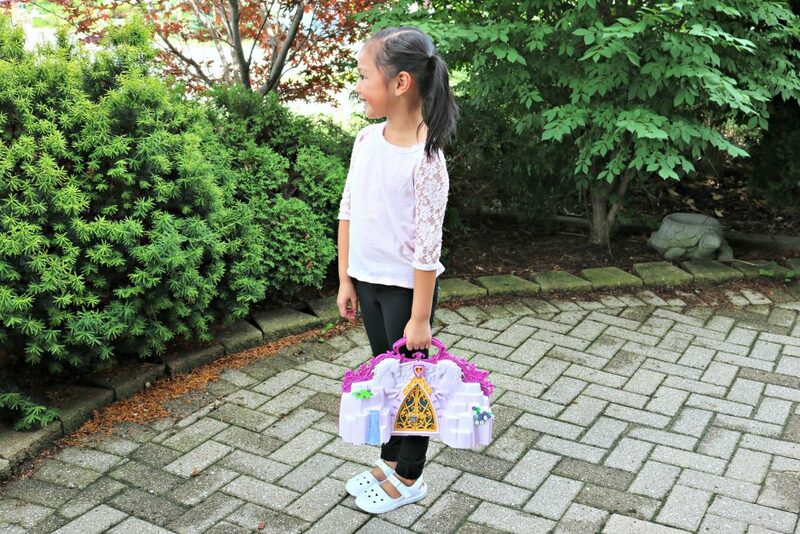 She has loved taking these to her grandparents’ house or sleepovers. Since you can pack them up and carry them like a little suitcase, it’s good to go! 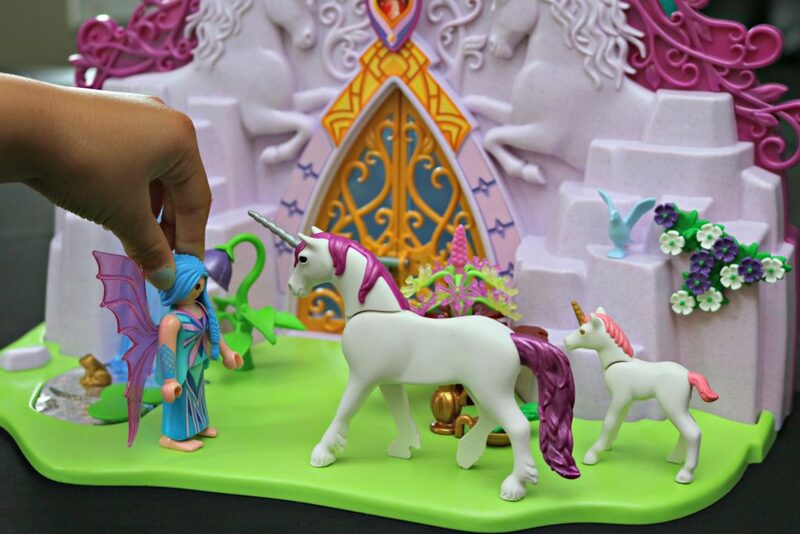 Discover the mystical world of fairies and unicorns with the PLAYMOBIL Take Along Fairy Unicorn Garden! Be greeted by your unicorn friends at the magical gate, enter the idyllic meadow, and pet the baby unicorns by the peaceful waterfall. 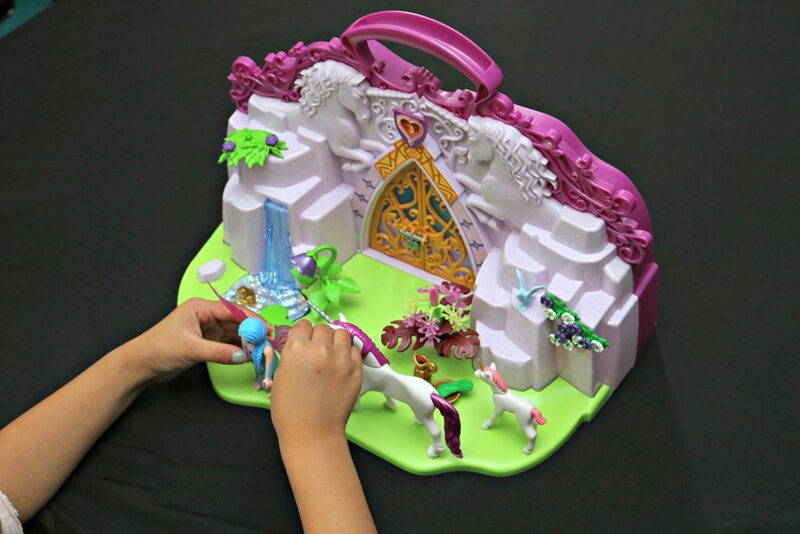 Once playtime is over, simply store the pieces inside, fold up the floor, and grab the carrying handle to take the fairy unicorn garden with you wherever you go. The rear scenery is fixed and cannot be folded. Everything can be packed away inside the carry case. The big gate can be opened inwards, and features a padlock to save losing all your pieces. Well, kids love farms and farm animals and to be able to take their farm wherever they go is so much fun! The best part is that they get to be the farmer and take care of all of the animals. You’ll find a cow, pig, dog, cat and bird! 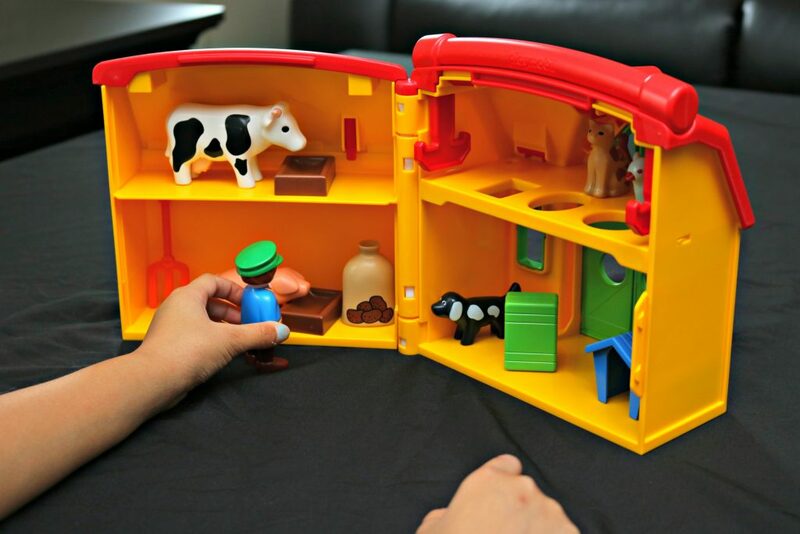 The best part is that they all have their own little area inside, so you can just open the farm and set it up on a table and your child can play! With the 1.2.3 Take Along Farm, kids will learn how to feed their farm animals, care for them, and watch them grow! Once playtime is over, simply store the pieces inside, fold up the floor, and grab the carrying handle to take farm with you wherever you go. With its bright and colourful design, and large and rounded pieces, this PLAYMOBIL 1.2.3 set is ideal for toddlers. Playset includes take along farm, one figure, dog, cat, pig, cow, bird, troughs, bag, barrel, crate, pitchfork, dog hut, and other accessories. This one also packs up and can be carried as a suitcase so they are all set to bring creative play with them. Mimi loved pretending to feed the pig and cow and I’ve even heard her playing a game of checkers with the cat! One lucky Whispered Inspirations reader will win a Take-Along Play Set. This contest is open to Canada and opens on July 14 and closes on July 29. Seeing our kids use their imaginations wherever they go is priceless and these PLAYMOBIL sets help them to do it! For more information, visit PLAYMOBIL and pick-up a set! How do help your child use their imagination? My little one is all about fairies and unicorns! She will appreciate that she can pack it to her grandma’s or freinds’ houses. I love this age where their imaginations are uninhibited and they can spend hours playing. I know my granddaughter would love this toy. My daughter would love the fairy unicorn garden set! Seeing as my hubby grew up on a farm, my kids would like the take-along one, for sure. I like the farm set most. The animals are cute and I know my boys would love it. Love the Fairy Unicorn Set, my niece would love it! Love that it is portable and can be easily carried to a friend’s house! My favorite is definitely the Take Along Fairy Unicorn Garden Set! So cute! I really like the Take Along Fairy Unicorn Garden set . I like that this is portable and my daughter would love to take this where ever we go, like on vacation or to the grandparents house. I love the Farmhouse play set! I like the Old McDonald farm set my grandson would love it ! My oldest granddaughter would love the take along Fairy Unicorn Garden the most and my youngest granddaughter would love the My Take along Farm the most. Thank you! My niece would love the Fairy Unicorn Garden set. I like the Take Along Fairy Unicorn set. My niece would love this and I have a special, childhood nostalgia for Playmobil! I like the farm set best-the little ones I babysit would enjoy this. My youngest daughter would love the farm set…and it would be easy to take along to play with! My granddaughter would love the Fairy Unicorn garden ! I would pick the fairies and unicorns set because we don’t have anything quite like it. I like the Take Along Fairy Unicorn Garden set the most. The farm set would be a big hit with my little guys. I just LOVE that they fold up and can go with you!!!! I would have to go with unicorns,they are at the top of my kids list. My daughter would love a set like this to carry around. My granddaughter is big on unicorns right now she would love this ! My granddaughter would love this set! I like the Take Along Fairy Unicorn Garden. It is so unique. My boys would have a blast with the farm! My granddaughter would love the unicorn set ! I have a niece and a nephew that would love both of the take along play sets! what a great idea!! I like the Take Along Fairy Unicorn Garden set the most! I know my granddaughter would love this set. JJ would love the farm. I have a niece who love the Fairy Unicorn Garden. My niece would love the Unicorn set. My granddaughter would be squealing if i gave her this ! I like the Take Along Fairy Unicorn Garden set. My niece would love these sets. I love the farm set! My niece would have a lot of fun playing with the fairy set. My granddaughter would love the unicorn set,seems that’s all she talks about lately ! I would love this set for my granddaughter ! I like the farm playset and my granddaughter would love it. my niece hailey would love it the most. i have a lot of nieces so whenever this type of question comes up, one of the kids stands out in my mind usually for it thank goodness! Thanks for the giveaway! My kids would love this! Hi,my granddaughter would love this unicorn set ! My daughter would love this set and keep her entertained when we’re on the go! I like the Unicorn Garden. It is magical. My niece would love the Take Along Unicorn Garden. This would be great for taking along on trips!!! I like the Take Along Fairy Unicorn Garden set! This unicorn set is so cute,the kids will love it ! My daughter loves the Fairy Garden Unicorn set!!! My granddaughter would enjoy this set. I would love to win this for my granddaughter,she would have hours of fun ! My youngest granddaughter would love this Unicorn set! The Unicorn Garden would be a treat for my niece.